Articles in last week’s Columbus Dispatch presented the symphony board’s proposal to address recent budget deficits by cutting the number of full-time players and reducing the number of concerts. Such cuts will devastate central Ohio’s orchestra. Those who attended Saturday’s concert were treated with a heart-warming performance that shows what wonderful music is possible with this orchestra and musical director. The first selection, Vaughan William’s “Fantasia on a Theme by Thomas Tallis,” featured an unusual seating arrangement. It was easy to spot three basses on each side and the cellos were divided into three groups with the principal’s chair in its usual position but with some of the cellos at the end of the section of first violins while another group of cellos were situated behind the violas. What a romantic, soulful interpretation! The second selection, Erich Korngold’s Concerto in D Major for Violin and Orchestra, Op. 35, featured local concertmaster Charles Wetherbee who once again treated us to his virtuosity. How does he play those high notes so flawlessly and with such ebullience? Entertaining encore with one of the bass players, too. The second half of the concert featured Junichi Hirokami’s energetic rendition of Beethoven’s Symphony No. 7 in A Major, Op. 92. The woodwinds excelled in the third movement. Such a heart-warming concert made facing the cold temperatures a bit more bearable. More than 13,000 librarians attended this year’s Midwinter Meeting in Philadelphia. In addition to endless business meetings, more than 500 publishers and technology-related vendors displayed their publications and demonstrated new products. But who expected booths selling jewelry or clothing or offering teeth whitening? The Reading Terminal Market, with 80 merchants offering prepared foods, produce and meats, is conveniently located next to the Pennsylvania Convention Center. Also nearby, the Gallery Mall has a full complement of fast-food franchises. Philadelphia also has many fine dining options. Thank you, Cengage Learning (which includes Gale), for picking up the tab at Oceanside! The 9th annual Arthur Curley Memorial Lecture featured jazz violinist Regina Carter who interspersed her positive stories with a lively musical conversation with her piano accompanist, Xavier Davis. Certainly, she is a deserving recipient of a MacArthur Fellowship, recognized for her extraordinary originality and dedication to her creative pursuits. The President’s Program featured basketball star Kareem Abdul-Jabbar, who is also a thoughtful, well-spoken author of several autobiographical and historical books. His latest endeavor, On the Shoulders of Giants, highlights contributors to the Harlem Renaissance. A reception at the Mütter Museum of the College of Physicians of Philadelphia was “disturbingly informative.” Founded in the middle of the nineteenth century to educate future doctors about anatomy and human medical anomalies, it now boasts more than 20,000 unforgettable objects such as a plaster cast of the famous Siamese twins, Chang and Eng, a collection of skulls, and the preserved body of the “Soap Lady.” This remarkable collection, which is not the best place to tour prior to dinner, leaves this visitor questioning what it means to be human. Tortola, the main island of the British Virgin Islands, is an interesting place to visit. 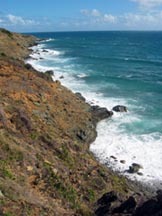 Our scenic tour, of course, included views of the port city Road Town as well as both Caribbean and Atlantic beaches. 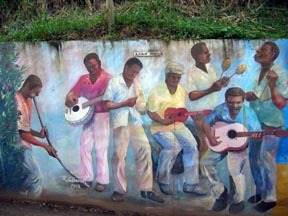 An unexpected surprise was the wall of murals in the Fahie Hill community. Local artist Reuben Vanterpool turned a retaining wall into a gallery of local history. He sketched a series of scenes on a wall about ten feet high and sixty feet long, and, with help from other artists, painted them in vivid colors. My snapshots taken from an open air bus include panels showing the watering of cattle, baking bong bong, heading to market, an oven full of bread, a funjie band, preparing sugar cane on George’s north side, inside the boiling house, memories of George’s north side school, and cutting sugar cane. Our tour included an extended stop at Cane Garden Bay. After buying souvenir clothing at an open air shop called “One Love,” we removed our shoes to feel the white sand beneath our feet as we enjoyed the calm surf and warm, clear water. 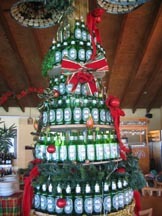 A buffet lunch at Quito’s Gazebo included seeing an unusual Christmas tree, one formed with Heineken bottles. Another great day as the year 2007 year comes to an end. The Caribbean island of St. Kitts is relatively small, about 5 miles wide and 18 miles long or only 68 square miles, but home to 35,000 friendly people. 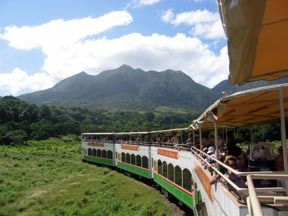 From near the airport just outside the capital and port city of Basseterre, we boarded the St. Kitts Scenic Railway, a narrow gauge passenger train, that was built to transport sugar cane. Although air conditioned seating was available, we chose to enjoy the open air atop one of the five specially designed passenger cars. We viewed secluded beaches on the Atlantic Ocean, abandoned sugar cane estates, and the interior mountains while enjoying complimentary beverages. After one rum punch, I switched to the delicious banana daiquiris. A three member choir serenaded each car as we tasted a sugar cake. When we passed through the colorful villages, children and adults with warm smiles waved. Our knowledgeable tour guide explained the history of this island which was occupied for many years on both ends by the French with the British entrenched in the middle. By 1783 the island was British, not becoming independent until 1983. This entertaining outing is a great way to experience this beautiful island. Our visit coincided with St. Kitts National Carnival, celebrated from Boxing Day to the day following New Year’s. As we walked the streets of Basseterre, we experienced the captivating sights of dancers dressed in vividly colored and bejeweled costumes, including elaborate feathered headdresses and masks, accompanied by the vibrant sounds of drums. The British and French took turns ruling St. Lucia many times before the British maintained control in 1814. This beautiful Caribbean island became an independent state in 1979. Interestingly, this nation with about 160,000 people has two Nobel laureates, including Derek Wolcott who received the Literature prize in 1992. Bananas, the primary crop, are facing increased competition as a result of changing economic policies in Europe. Tourism, of course, is also a significant source of income and the island has much to offer. 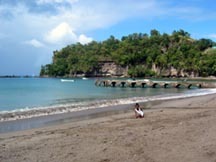 For example, Anse la Raye, on the southwest coast not far from the capital and port city of Castries, has a picturesque beach. We took a bike ride out of the village and traveled on a partially paved and in other places muddy road up into the rainforest. A short hike allowed us to experience the cascading water from the Venus Waterfall, a wonderful destination, but keep your distance if biking with others. St. Maarten, the Dutch side of a Caribbean island shared with the French, has a beautiful eastern coast. Guana Bay, named for iguanas no longer prevalent, has a long, wide beach with excellent sand. Benny Goodman owned a house in this area which has been in disrepair since Hurricane Luis in 1995. John McEnroe owns a home here. This quiet side of the Atlantic has colorful water pounding against the rocky coast. When hiking, however, beware of thorns sharp as nails and capable of penetrating a tennis shoe. Barrel, pipe organ, and prickly pear cacti, as well as other thorny plants, are prevalent .